The year went a bit like a multi course dinner: one edible thing after the other. And since January is a time for reflection and thinking about the year that passed, why not do that in food? So here goes, the best and most interesting meals of 2017. 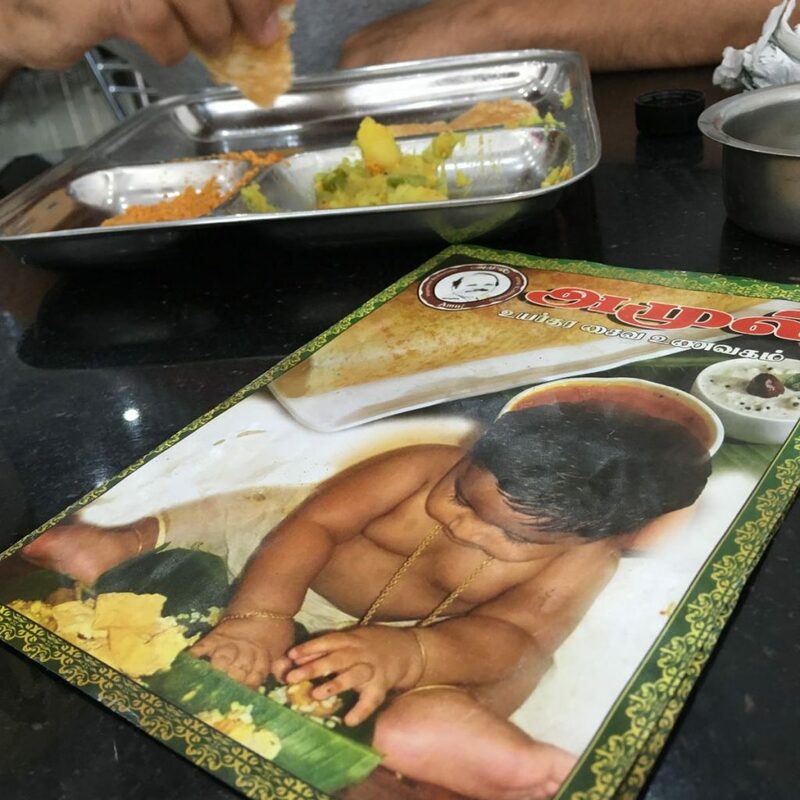 The year definitely started off in style – the kind of style demonstrated by the baby on this menu. Each time in South Asia, knives and forks are dropped immediately: there’s only one way to eat Indian, Pakistani, Bengali and Lankese food, and that’s using the fingers of your hand. Luckily, there’s quite a lot of using your hands in the Middle East as well (even though there you use a piece of bread, not your thumb and fingers). I just find that the food tastes so much better like this. A bit like how swimming in the sea is so much better with no swimsuit! 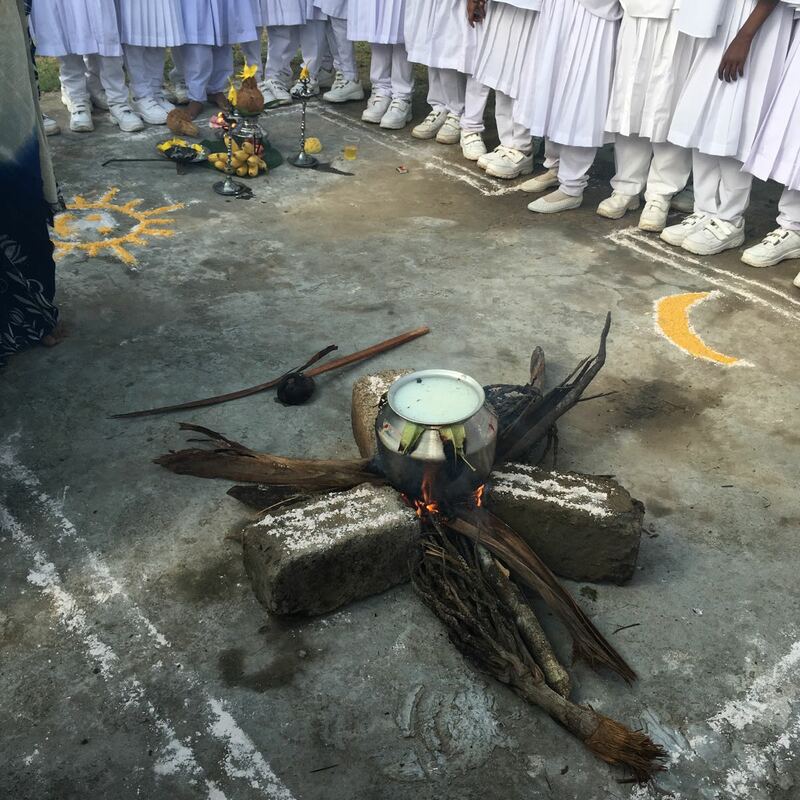 Also in Sri Lanka, up in the northern part of the island where Karim and I spent time reporting on the India-Sri Lanka fisheries conflict and post-war returning refugees, we got to celebrate Pongal, the harvest-time festivities that are one of the most important yearly occasions for the Hindu community. 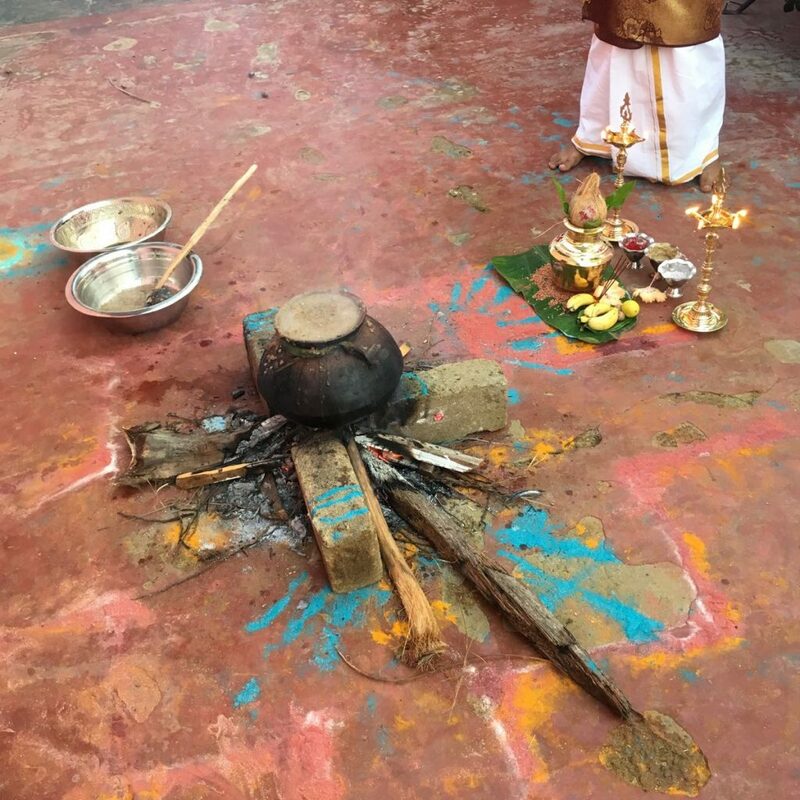 The dish cooking over the open fire is pongal, a slow-cooked and sweet rice porridge, with cashew nuts, milk and spices. We were invited to a friend’s house in the morning, to start the fire and begin cooking the rice. 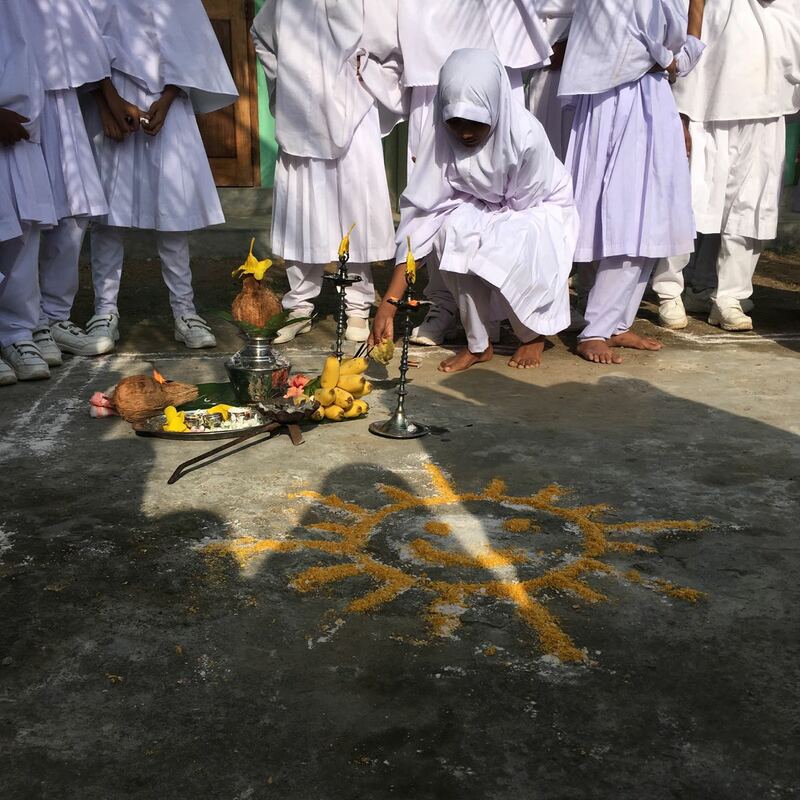 In the afternoon, in the traditional Muslim school in the northern town of Jaffna, we joined the students who celebrated Pongal as a way of paying respect to the diversity of Sri Lanka – the island is home to all of the world’s four largest religions: Buddhism, Islam, Christianity and Hindusim, and many see sharing and coexistence as important parts of the country’s culture. This is another simple and slow-cooked dish, but the opposite of something eaten only on special occasions: the hot chickpeas will decorate a plate of hummus, one of the mainstays of the Lebanese kitchen. 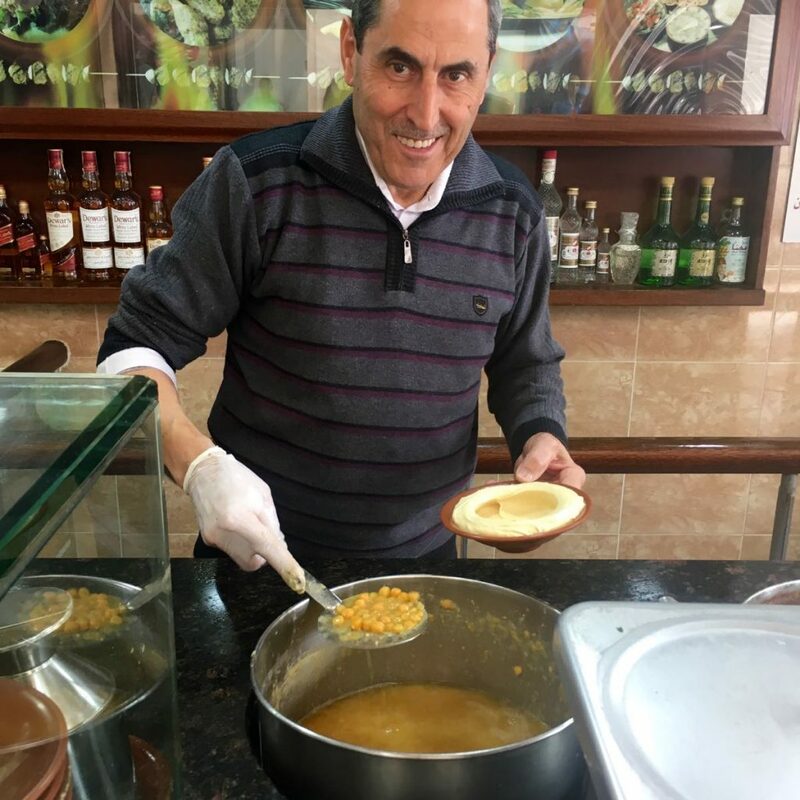 While spreads and dips called hummus can be found on menus in restaurants across the world, there is only one way of making original hummus and that’s following the same recipe as this man over here: freshly cooked chickpeas, generous amounts of good-quality tahina and a layer of baladi, local and rurally produced, olive oil. Since we’re at with the essential Lebanese dishes, here’s another something that could be priced in gold but remains one of the cheapest meals (probably the single cheapest) to be had in the country. 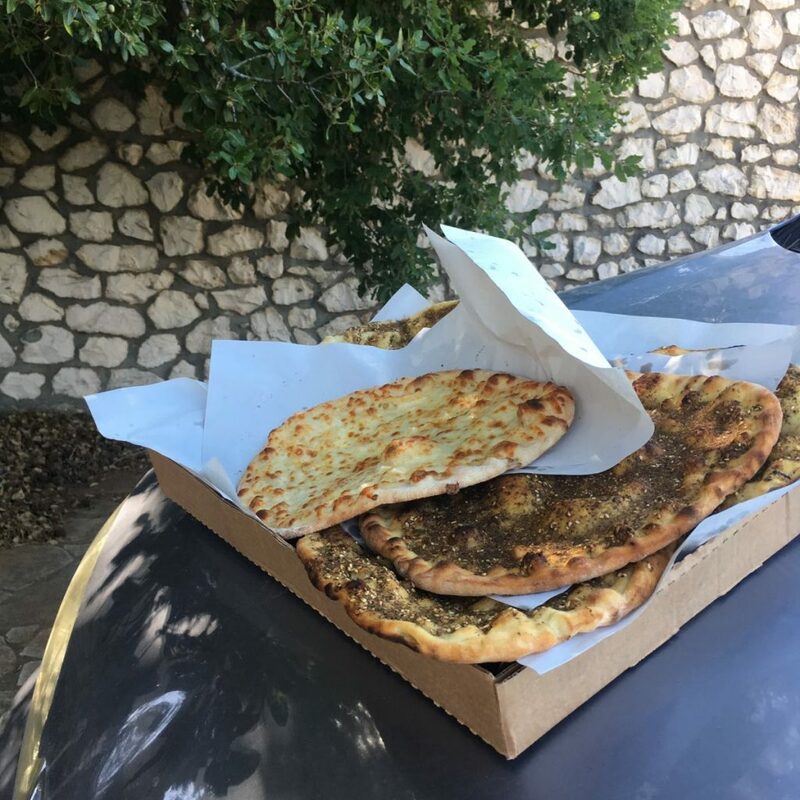 Manaeesh are fresh-out-of-the-oven flat breads, covered – when they’re at their best – with an oily mixture of dried wild thyme and sesame seeds called zaatar and best eaten on the way to a roadtrip or lazy weekend excursion, seated on the side of the road or inside a car with open windows and a nice playlist with loud music. Then, there was the zaatar again. 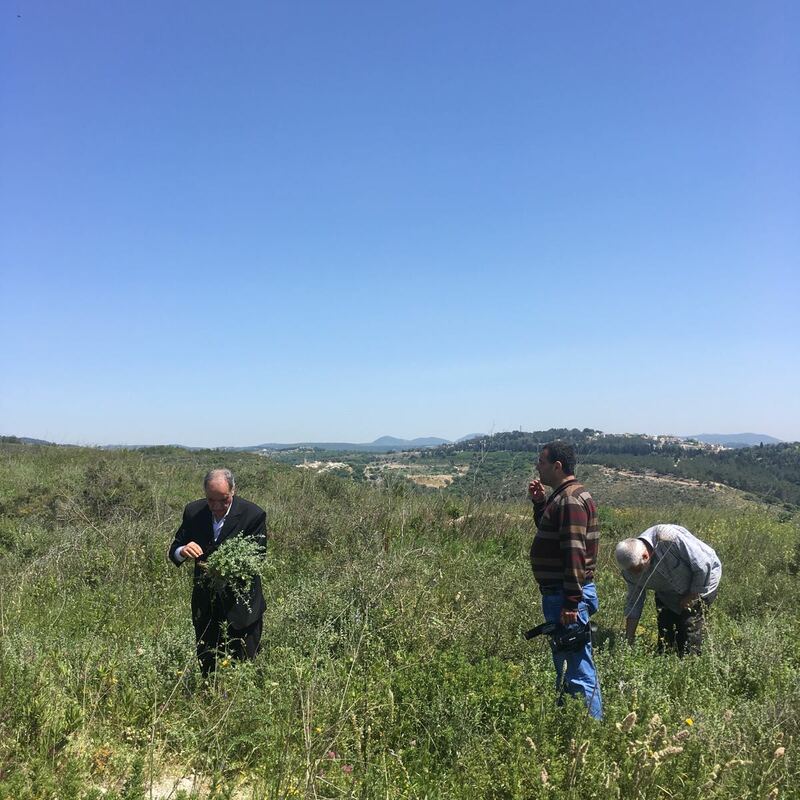 Zaatar grows all across Lebanon – in the mountains in the north but also in people’s backyards and all over the hilly landscapes of the south – and is at its best when eaten just like above, mixed with olive oil and spread on pieces of fresh bread. The dried mixture and the fresh plants are both called zaatar, and there are numerous variants of the former: some has the slightly sour spice sumac mixed along with the sesame, others may have cumin or crushed nuts. These images were taken during a press tour organised by Hezbollah, down on the southern border of Lebanon – it was funny because as the hosting guides, dressed in army fatigues and proper jackets plus pants, started to repeat themselves (the tour was after all an effort to convince Beirut’s press corps of the strength of Hezbollah’s defence and the professionality of them as a group, which turned out to be a quite lengthy process), people in the group began to stray away into the fields. 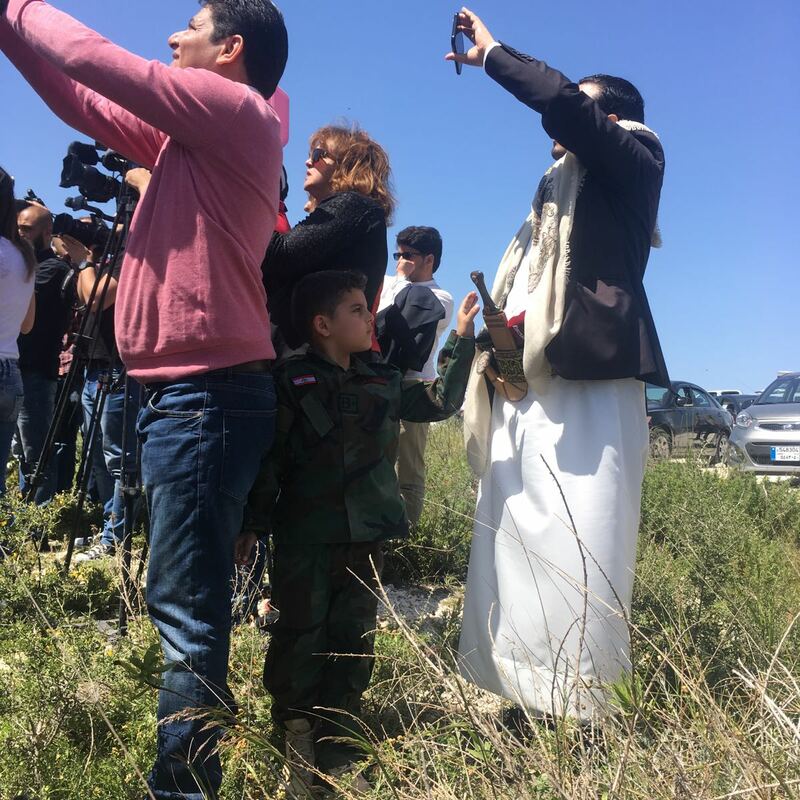 Lebanon is a highly densely populated country, one of the world’s top-five if we take away islands and city-states, and for many, there’s just not that much untouched nature available. Well, in this trip there was! Obviously, because the land near the border is not open for people to freely roam around normally. 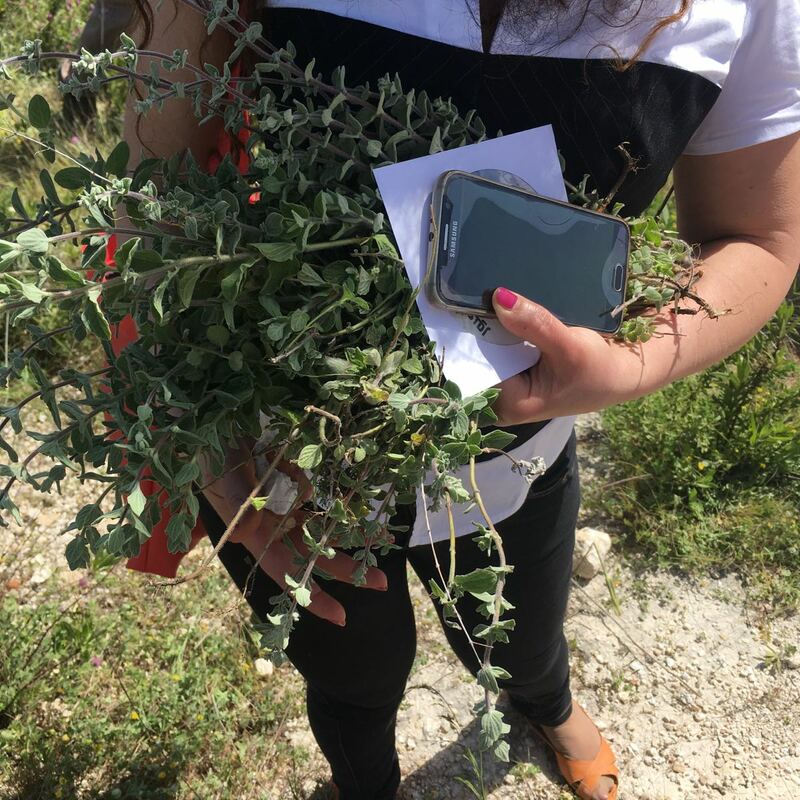 I guess people just took the chance to spend some time in the wild greenery (and bring home bunches of fresh zaatar). There was not just the eating of food of course, there was also the buying. 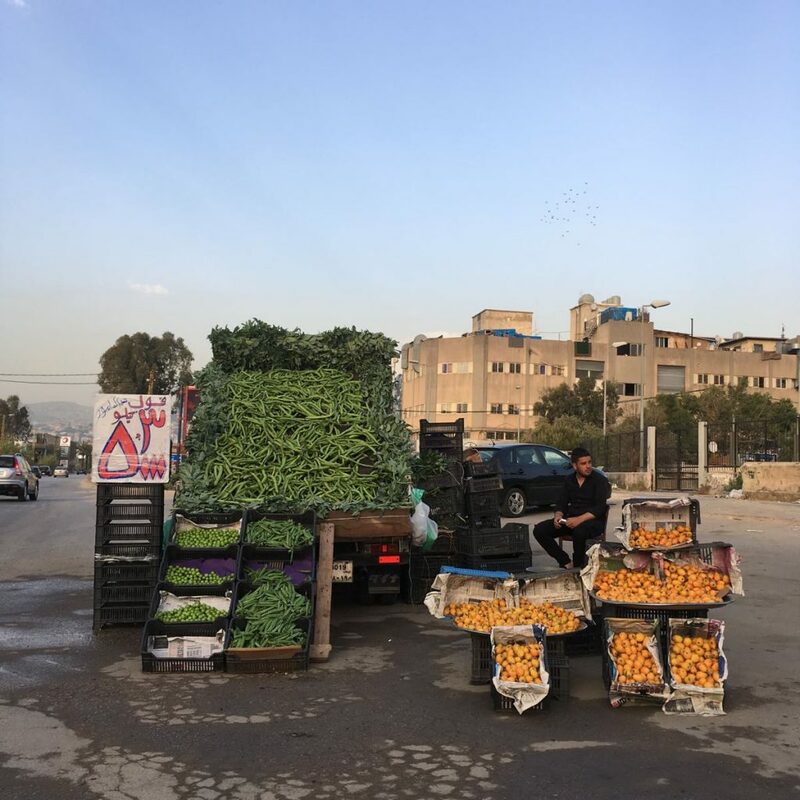 From roadside stands like this in Lebanon, where the produce changes with the seasons. Not only with the seasons actually, but with the weeks. In summer, you can know exactly what time it is judging by what’s for sale (and when it’s very cheap – because each fruit has a period of time when it’s available, and the price is at its lowest, and taste at its highest, at the peak of that season). Mishmish, apricots, come first. Then peaches and nectarines, right before the entrance – with a fanfare! – of cherries. They’re tiny and bright red first, then grow larger and darker as the weeks pass. There’s also the light red kind, which has a shorter season but is just as good. The cherries often last almost until the first figs arrive, which is about the same time as the small, green grapes; larger and yellowy-green grapes ripen later, as do the purple ones – and finally after that the black grapes, which last all the way through the beginning of winter. Then, there was the trip to Central Asia. 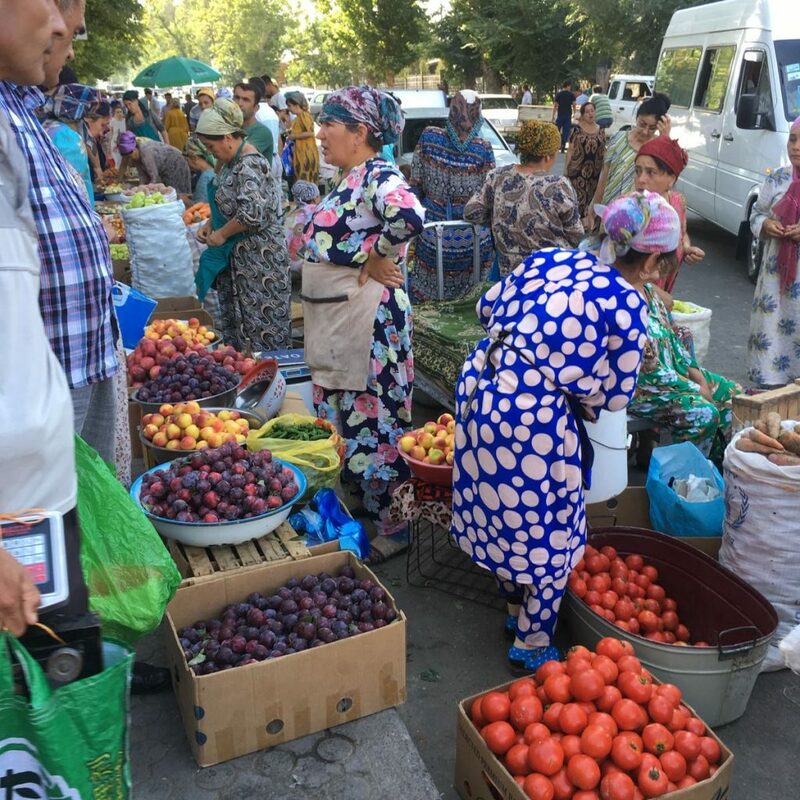 Here’s the market in Khujand, a city in northwestern Tajikistan and once a major stop on the silk route. Khujand is less busy these days, but the market remains magnificent. This is further down the main street running past the market, which is lined with fruits and vegetable sellers from the early morning. Speaking of apricots by the way, this is apricot country like nothing else. The trees grow everywhere in the surrounding valleys, and houses are built often entirely from apricot wood. The kinds for sale are many – from tiny and bright orange ones to softer fruits with yellow skin. The thing with apricots – or ‘eggs of the sun’, as Iranians like to call them – is that they don’t transport well, not at all. So exporting or even selling them in distant places is hard. They’re simply meant to be enjoyed right there, where they grow. 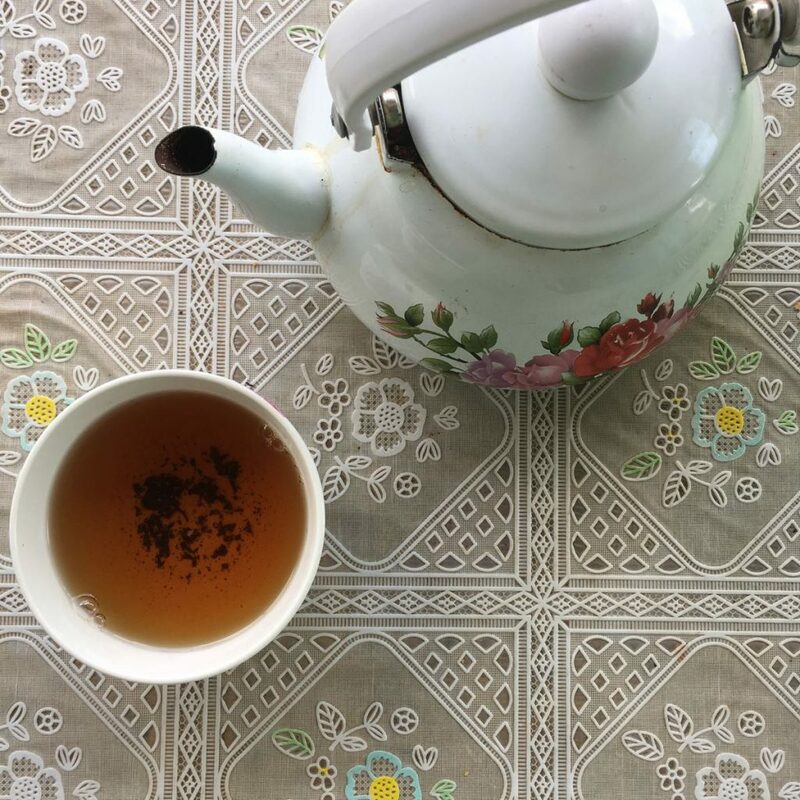 It’s not food but you put it in your mouth – and it was a defining feature of the trip to Central Asia, so here’s to, of course, tea. Sometimes I wonder how it is that I was born in the tea-illiterate Scandinavian north and not somewhere – anywhere, really! – in the vast and wide-stretched lands where people take tea as serious as life itself. Tajikistan and Kyrgyzstan, the twin destinations on this small trip, are among those places. Here, tea is part of everything. Of meeting friends, of spending time with family, of enjoying loneliness and solitude. Just tea, nothing else. Tea in large pots, enough for refilling a cup more than enough times. Which I did. Apart from tea, the other essential thing during that trip was bread. 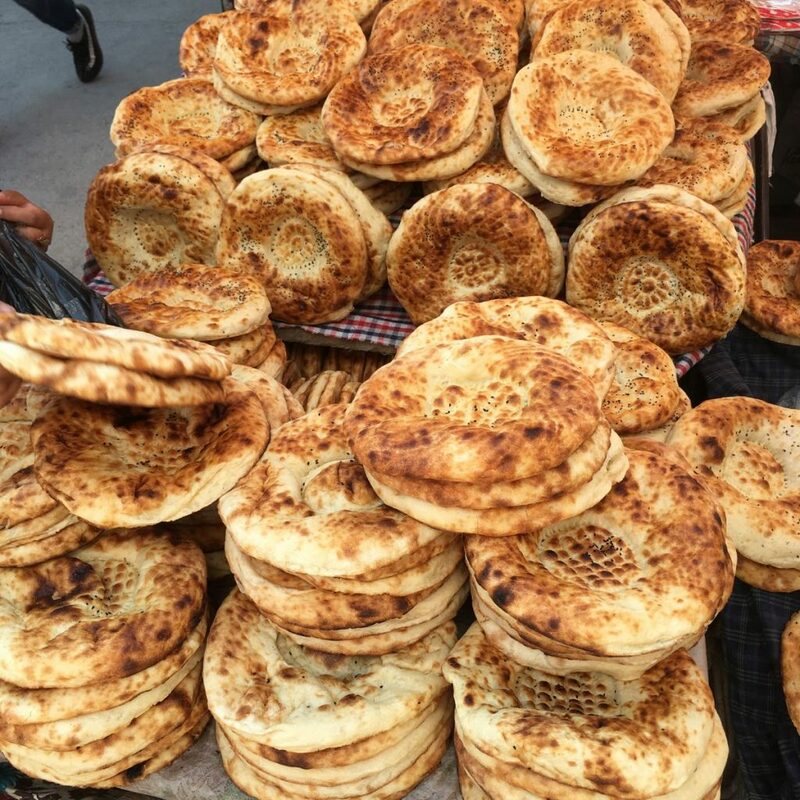 Nan bread: round, flat and chewy. Fresh (because there are bakeries – read ovens – everywhere, and there there are not there’s a bread seller with piles of nan). Holy, actually, in the sense that it represents something very close to human essence. It’s nourishment coming straight from the hands of another person; from their care and attention, the work they put into kneading the dough. Alovaddin, this photographer I worked with in Khujand, told me that bread indeed has an almost holy meaning to people there. It’s considered forbidden, unthinkable, to throw away bread, he said. Indeed, throwing away food overall is something bad, but when it comes to bread it’s really out of question. Families would keep any leftover bread and give it to animals and birds – anything except wasting it. 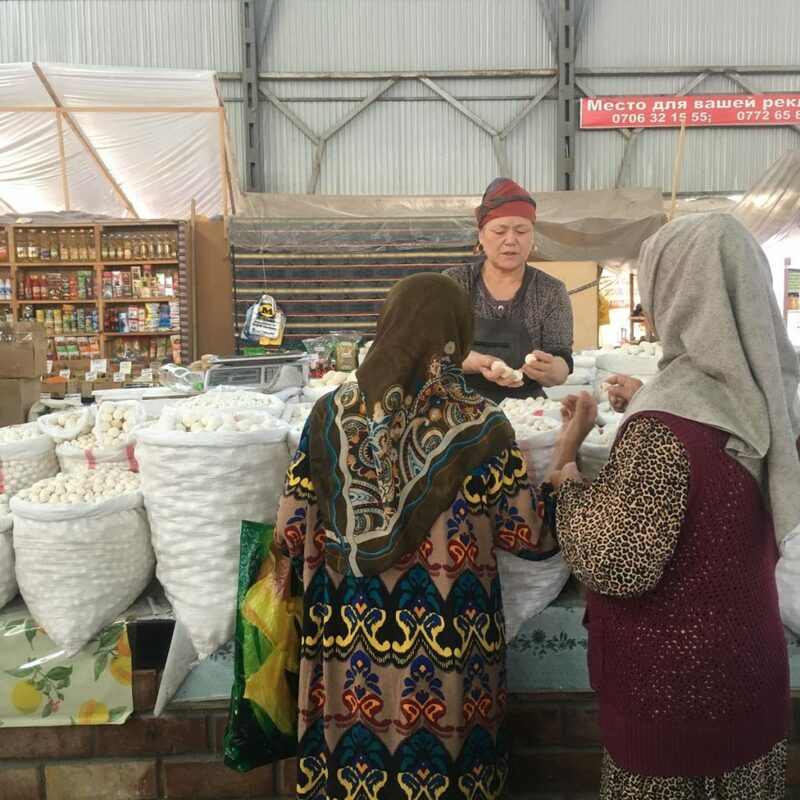 Next Central Asian food stop is as good as the other two – this image is from a market in Kyrgyzstan’s capital Bishkek, where two women are buying kurut, hard and salty balls made from dried and fermented yoghurt. Just like tea and bread are cross-border food phenomena (you saw the bread, it is round and flat and called nan – India, Pakistan, Afghanistan have exactly the same nan, which by the way is Persian for ‘bread’), so is kurut. The minute I heard about it, I came to think of Lebanon’s kishk, a coarse and grainy powder made from fermented yoghurt and bulgur, often eaten mixed with olive oil (and spread on a manaoushe like the zaatar above). The Wikipedia article about kurut actually takes you to an entry for ‘kashk’, which gathers all of these fermented dairy products – from Lebanon and Syria’s kishk and Turkey’s tas yoghurt which is often used in soups to Iran’s smooth and liquid kashk and the popular Afghan dish kichree qurut where the fermented dairy is mixed with rice and mung beans. I saw kurut all across Kyrgyzstan; no wonder as this small and mountainous country has a strong nomadic tradition and a culinary culture that relies heavily on animal products and whatever can be accessed when you are moving from place to place in harsh terrain. Someone I met on the road there told me about her grandparents who, when they grew up, would eat very little other than kurut and horse meat and milk. Things are different now of course, but people still love their kurut! It’s typical to find it in small roadside stands, often in city parks and popular spots where families go to spend time. When you buy kurut in the market, there are many kinds available: small ones rolled into what looks like large beads, chubby pieces that still have marks from the fingers that formed them, or round and snow white, powdery balls. With this image, we move to the beginning of autumn and another trip, this time to the largest country on the Arabian Peninsula. I am still amazed that I got the chance to go there – visas to Saudi Arabia are extremely hard to get by, and we were fortunate enough to get them through Atharna, the organisation documenting Middle Eastern handicrafts that I’m working for. As always when traveling in the Gulf, I had quite a lot of Indian food (there are so many people from the subcontinent working there and I think the Gulf has the best Indian food outside of India – and very cheap as well). We also had several great meals in the southern part of the country, Bedouin style with enormous pieces of warm bread shared between everyone seated on the floor around the table, and several dishes to go with the bread. The best one was probably a thick and gluey porridge-like dish made from wheat and oil, flavoured with mild spices. We had a lot of Yemeni food as well, cooked amazingly well in small stone pots over an open fire. The foul (bean stew) and addas (lentils) we had were oily, thick and extremely tasty – and much too cheap given how beautiful they were. 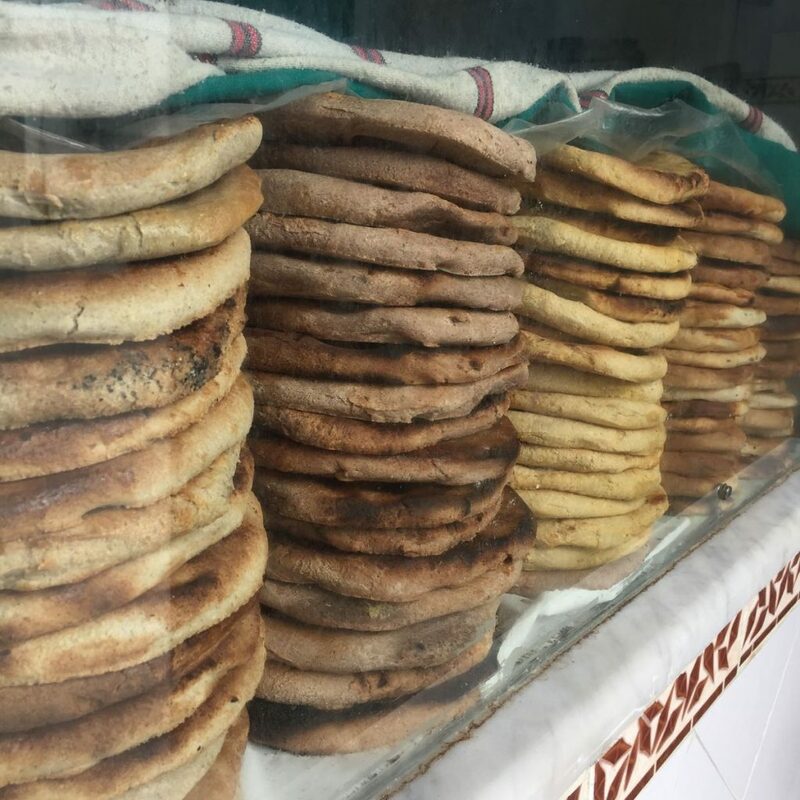 But the perhaps best food memory of all is of the lahouh, a Yemeni savory pancake very similar to the Ethiopian/Eritrean injera (the countries are neighbours, with only a narrow strait in between the peninsula’s coast and that of eastern Africa). In Jeddah, I bought the lahouh from a tiny bakery in the middle of the historical Al Balad neighbourhood, then brought it to our hotel and had it for breakfast in the morning, with only avocado and salt. Amazing. The bread in the photo above come from the same bakery: they were more photogenic even though much less fantastic than the lahouh! Saudi Arabia – dates, what more to say! I will always have fond memories of sneaking into a date shop and getting treated to samples of all different kinds. 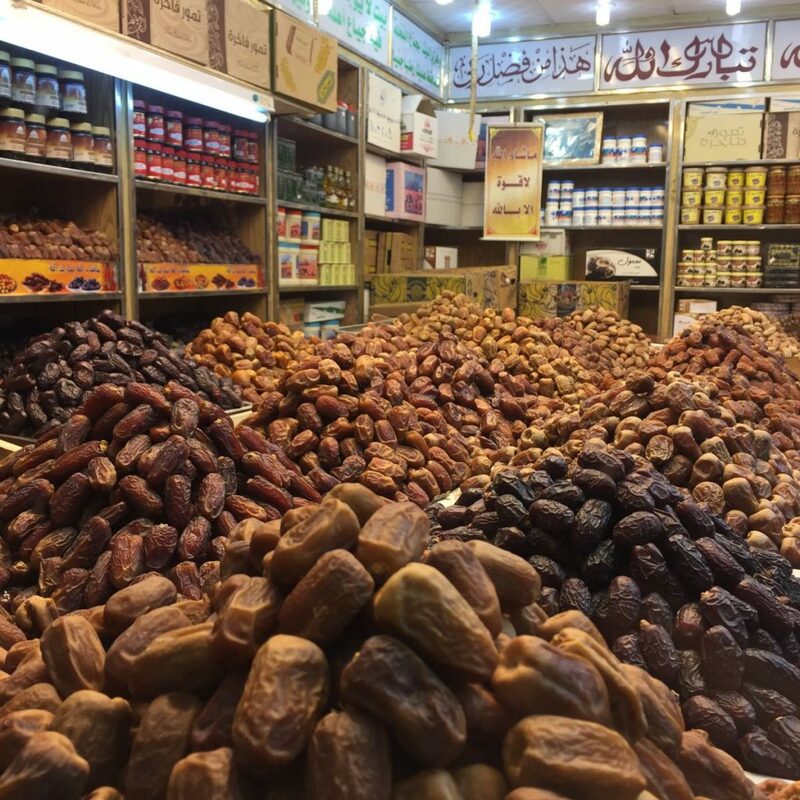 There’s the Saudi favourite sukkari which, as the name reveals, is a deeply sweet date; then there’s the harder and drier kinds from Najran in the south, or the exquisite and expensive Medina dates. My personal favourite – though it’s almost impossible to chose only one – might be the kind I bought an entire box full with and brought with me to Sweden: saghai, the kind in the middle of the photo to the right, with a light brown colour at the top. For anyone who is a runner, I cannot recommend dates highly enough! They are really the perfect snack, much tastier than any sports bar and packed with both energy and nutrition. An Indonesian group of travelers, doing the hajj piligrimage to Mecca, during a stop in Jeddah on the way home. 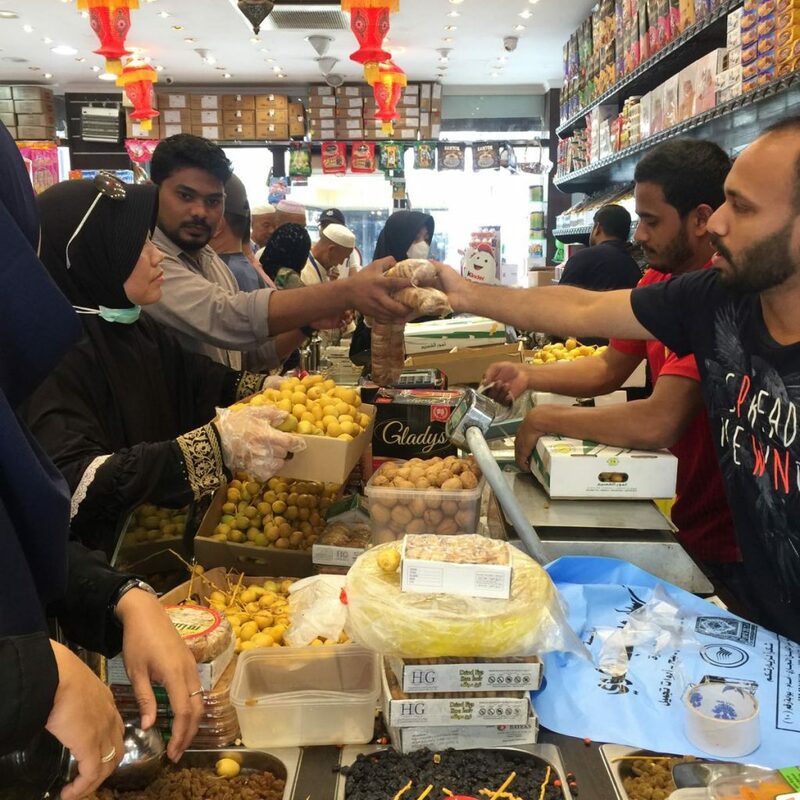 There are several shops in Jeddah catering to these pilgrims and selling all kinds of souvenirs – including the most ubiquitous of them all, dates. Finally, a meal that I never ate! But it still qualifies here because I like what the image represents. The woman in the picture is a lady in Jeddah, Saudi Arabia’s second largest city. 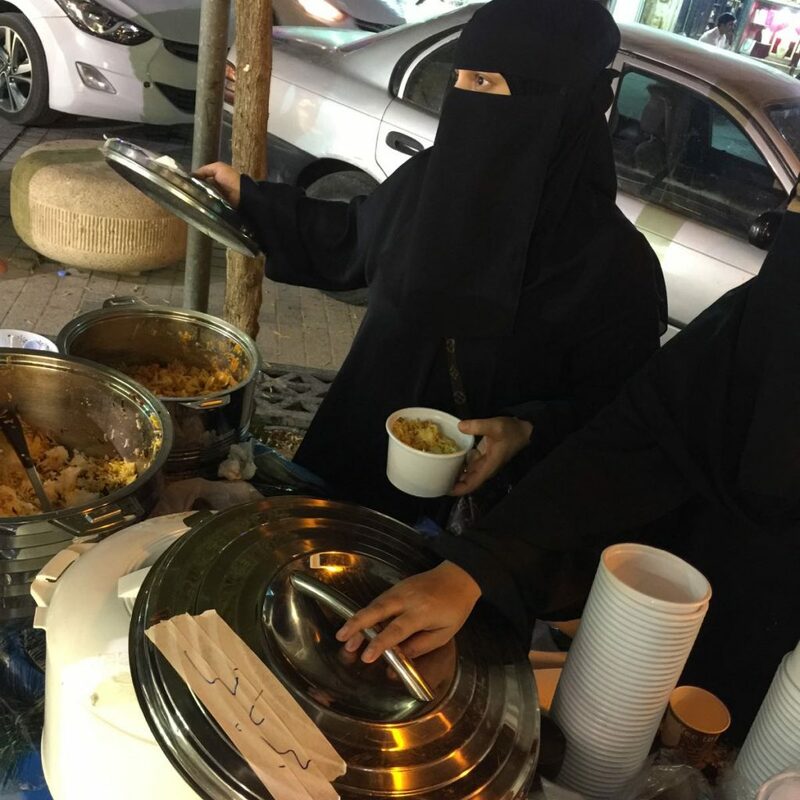 Each evening, from after maghreb prayers (around 7-7.30 when we were there, but it varies throughout the year) until late, she sells home made food on the side of the street in Riyadh’s old market area Al Dirah. With that, she’s really the face of today’s Saudi Arabia – a country that’s in a very different place now than only a decade or so ago. Society is still heavily conservative and a lot of segregation remains, but Saudi women are so much more than the image you would get through the media. They’re behind a lot of change and, given the restraints they face, are doing some impressive things for themselves. The future could not be more interesting from this horizon. That’s it – to many more tasty meals in 2018!